It’s always a poignant moment when a revered political figure dies; the sort of individual who inspires you to vote and take an interest in the intricacies of democracy. 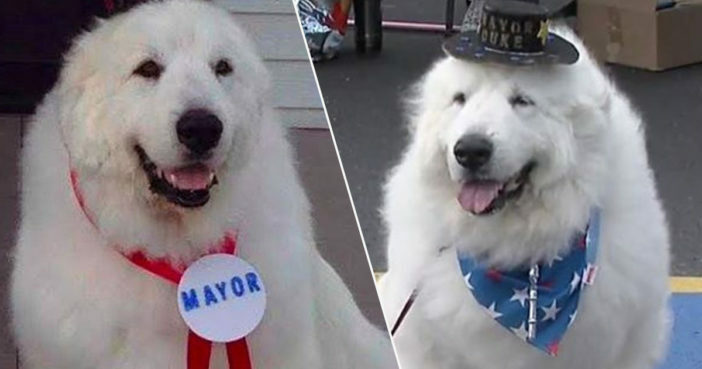 Duke the Great Pyrenees dog was one such politician, serving as the mayor of Cormorant Village, Minnesota, for four faithful terms. And his passing will no doubt leave a sadness no amount of sticks can soothe. In 2014, the gentle giant became the very first mayor of Cormorant. He went on to serve his constituents with the loyalty of his kind, even if he was a little prone to napping during town meetings. Mayor Duke led parades, appeared on billboards and represented his town with a big grin and a friendly disposition. The sweet boy also had a significant media presence beyond his own hometown, appearing in magazines such National Geographic and Scholastic. He also made television appearances, welcomed as an honoured guest on Steve Harvey’s talk show. Whether campaigning at local schools or attending the World Dog Awards, Duke upheld his campaign promises to be a Good Boy, bringing a cuddlier, kinder brand of politics. However, old age comes to us all and last year Mayor Duke retired due to ill health. As reported by DL Online, Duke dedicated plenty of his well-deserved retirement to munching his favorite treats, which included cheeseburgers and beef jerky. Like many former politicians, Duke also found the time to reflect on his years in office with a book, entitled, Meet Mayor Duke. Dedicated Duke passed away on February 21 at the grand old age of 13, having reportedly suffered from arthritis and lyme disease. His owners also suspected he had been struck by a car a couple of years back. He will be greatly missed. We will have a memorial for him in March or April at the Cormorant town hall. Thanks to all who express their condolences it means a lot of hard times like this. Sincerely, Karen and Dave. Those who have been inspired by Duke’s incredible rise from humble farm dog to admired politician have taken to social media to pay their respects. A big “Rest in Power” to Duke, mayor of Cormorant Village, Minnesota. One of our last bastions of hope, snuffed out far too soon. While he sat atop Cormorant Village’s vast political machine, Mayor Duke’s tenure was without scandal or corruption and he will be missed. Rest easy Mayor Duke. Your life has left an indelible paw print on the town you loved, and your human friends will always be proud of you.